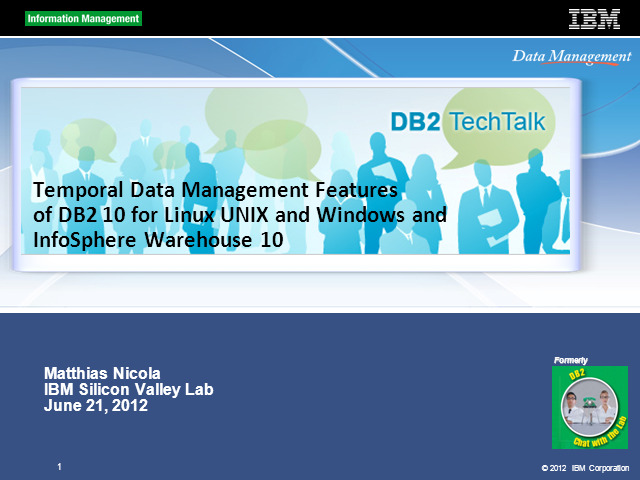 This Tech Talk continues the "deep dive" on all all new IBM DB2 10 and IBM Infosphere Warehouse 10 features. Matthias Nicola from IBM labs explains the new Time Travel Query feature, which is a collection of bitemporal data management capabilities. These capabilities include temporal tables, temporal queries and updates, temporal constraints, and other functionality to manage data as of past or future points in time. Time Travel Query helps improve data consistency and quality across the enterprise and provides a cost-effective means to address auditing and compliance issues. As a result, organizations can reduce their risk of noncompliance and achieve greater business accuracy. Please note that this webcast is conducted at 12:30 PM ET. You may see this time translated into your local time zone.